On Saturday, February 22, 2014, Wietrzene Radio 1080 AM celebrated its 14th Carnival Ball which took place at the Chateau Ritz banquet hall. On Valentine’s Saturday, February 14, 2015, took place the 15th Ball of the Wietrzne Radio Polish FM. During the ball, organizers handed out POLONUSEY 2014 – prestigious awards to the Chicago Polonia. 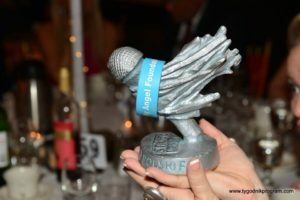 In the category ACTIVIST OF THE YEAR, the statuette went to Katarzyna Romanowska (You Can Be My Angel); in the Business Person of the Year category – Grzegorz Wozniak (Doors For Builders); in the Journalist of the Year category – Jacek Zieliński (Radio Polski FM); in the Sport Person of the Year category – Andrzej Fonfara (boxing) and in the Artist of the Year category – Profusion team. The “golden”, honorary Polonus was received by Marta Blicharska (Polish FM Radio). Nearly 800 guests enjoyed to the morning hours to the hits of Bogdan Fabiański, Fox bands, Marshal Band and Profusion!